Creating an idea for an event to making it sell-out is not easy. Done right, events have the potential to create a lasting impression amongst your guests. When using interactive content – before, during and after an event – you can connect with potential customers. When using IC you offer people to join you on the journey, from planning and executing the event. With interactive content people are no longer just receiving information; now they have a say and can interact with your brand. On top of that, you gain information and feedback from your clients, and of course more leads. Below we have listed a guide on how you can use interactive content and social media to promote your event before, during and after. Anticipation, the feeling of waiting for something. Let’s start simple, you can use anticipation to sell the event by creating a hashtag for it and sparking a conversation and a debate about the topics your event promoter on social media. Twitter is especially good for this purpose. Here, you can use interactive polls, to ask questions to spark a debate and engage with your customer. ‘Who do you look forward to listening to speak?’, or ‘what topic do want to be covered?.’ Give people a say when planning the event. You can also reveal speakers in creative ways through interactive content, countdowns and teaser videos. Remember to promote milestones such as the releasing of early bird tickets and ask people to tag a friend they would like to take with them to spread the word further. You can use urgency to push the ticket sale further and motivate people to get their ticket now before it’s too late. You can do so by posting whenever early bird ticket sales or registration are about to end. You can create anticipation by sharing pictures from behind the scenes from setting up the event. Use every opportunity to invite people to join in on the conversation through interactive polls asking questions like ‘what do you think of this, should we go for the yellow or blue colour for this?’. It’s a great way to boost conversation and engagement. FOMO, the fear of missing out. Most people in the digital age have a serious case of it. Let’s talk about what that means to you. Posting pictures from last year’s glamorous event can sparkle up a desire to not to miss this one. It’s a way to reel in people who are not sure if they want to attend. To further attract the ‘undecided ones’, you can offer people a new window of opportunity to get tickets. Give out VIP tickets or offer discount codes with an interactive quiz. Don’t forget to include a signup sheet so you get their email addresses. It provides you with the information needed about your audience to further market your event with a follow-up email. Pro tip: In the quiz, ask questions about people’s interests and preferences and you can tailor the follow-up email based on their interests. Showcasing speakers they might be interested in. Interacting with your guests makes them feel special. Use interactive polls and quizzes are a great way to interact and gather information that will help you keep the conversation going afterwards. You can ask which talks people enjoyed the most or which one they learned the most from. The results you can use to keep the conversation going after the event, showcasing the results: “The most loved speaker”. For most events you can utilize the gathering of professionals with polls and ask questions about their working habits, that will help you and interest your guests. For a marketing event you can ask how marketers split their day: brainstorming, researching, writing, creative work, drinking coffee, daydreaming or staring at the wall. Don’t be afraid to use humour as well. It goes without saying, like everything during the event. Have someone sitting on the like button, following your event’s hashtag and share, like, love and repost. It makes people feel like they are special. During the event, you can also take exclusive interviews with guests and speakers and behind the scenes photos. Don’t hesitate to utilize Instagram Stories, Snapchat and Facebook live for this. Even though your event is over, the digital conversation is not. You can keep the conversation alive with diverse content and maintain the buzz through pictures, videos and interactive content. You can start with taking the pulse of the event by using interactive polls to ask about people’s experience. It provides you feedback about what could be improved. Both positive and negative feedback is valuable when planning your next event, there is always room for improvement. This also transfers into fantastic content and multiple social media updates. Ask people to participate in your polls, thank people for their useful feedback, announce some of the useful feedback and explain it will be taken into consideration for next year’s event. It shows you care about people’s experience. This is also the time to post interactive graphs showcasing the results from the polls you took during the event and announce ‘the most loved speaker’. This reveals exclusive information that can be important or fun to your audience to view. Digital marketers can see how their time management compares to their peers, doctors can see what medicine their peers subscribe the most, and coders can see what programme their peers use the most. You had the chance to dig into working habits of the industry your event and now it’s time to use the content you already have. Pro tip: Don’t forget to tag the speaker afterwards when you announce ‘the most loved one.’ They might have many followers and are likely to share the good news with them. 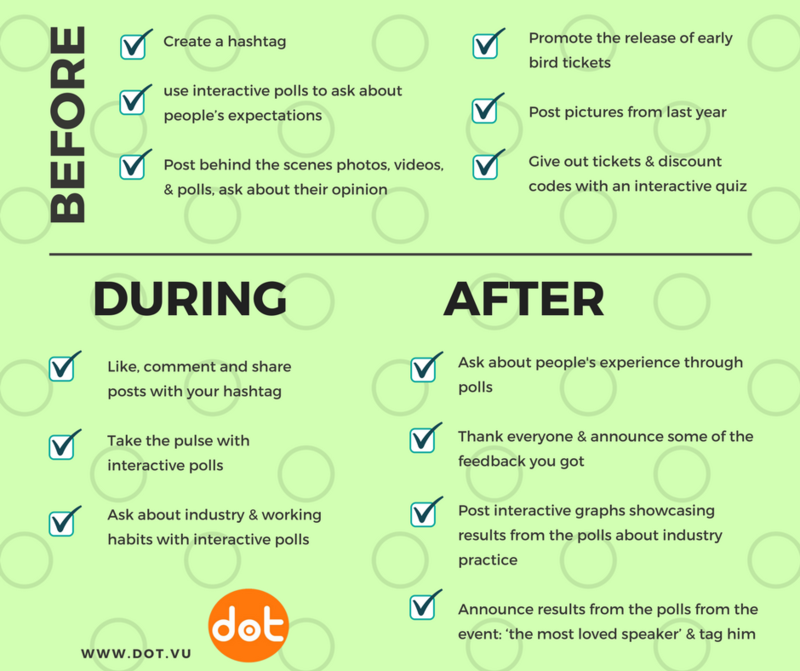 Now that you are familiar with how to promote events before, during and after. Let’s move on to how you promote various events differently with interactive content for optimal results. When promoting a seminar, a quiz contest can help you to learn more about your audience before they attend. It enables you to tailor your seminar and make sure you meet the expectations of those attending. 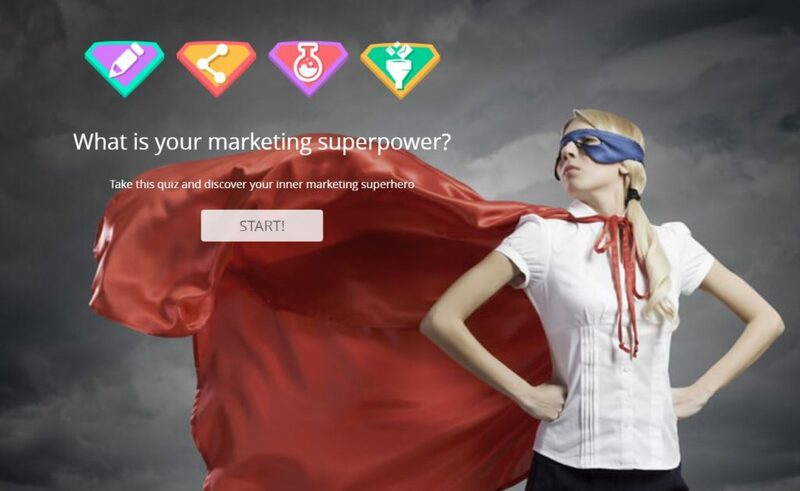 You start by setting up a quiz that tests how people stack up in their profession; it can be ‘what kind of a marketer are you?’ Curiosity motivates people to take the test and reveal to you their interest and areas of knowledge to be improved. At the end of the quiz you can offer them to come to your seminar to expand their knowledge in the area they need to improve. You tailor the results, based on their replies. For someone who scores low on SEO, you can have text appearing in results about your talk about SWO on the seminar. The information you gain also gives you a good start for writing a personalised follow-up email. 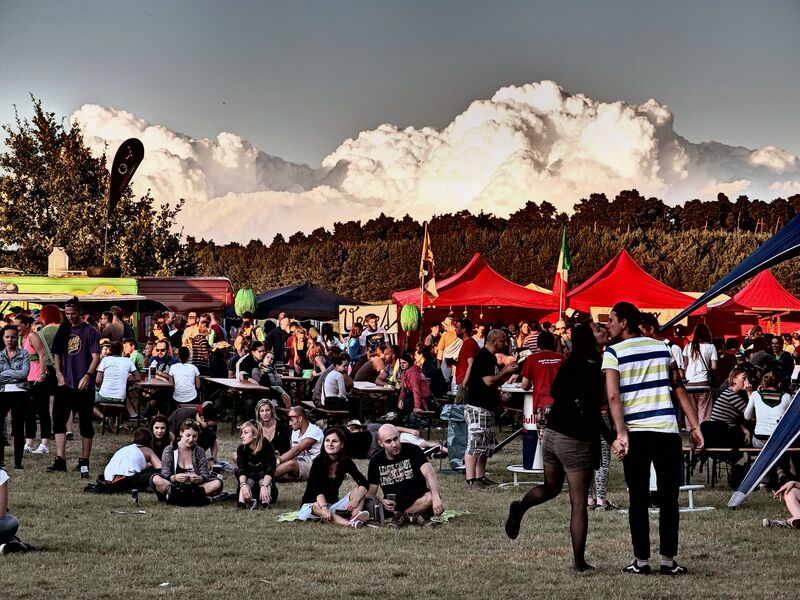 While promoting large conferences and festivals, the number of seminars, talks or artists playing can be like a jungle, hard to find a way through. You want the best for your attendees. Asking about people’s interests in an interactive quiz can help them find their way. Say you are planning a Festival, you create a quiz asking about the categories of music they like. List a couple of the artists and ask which one do you like the most. 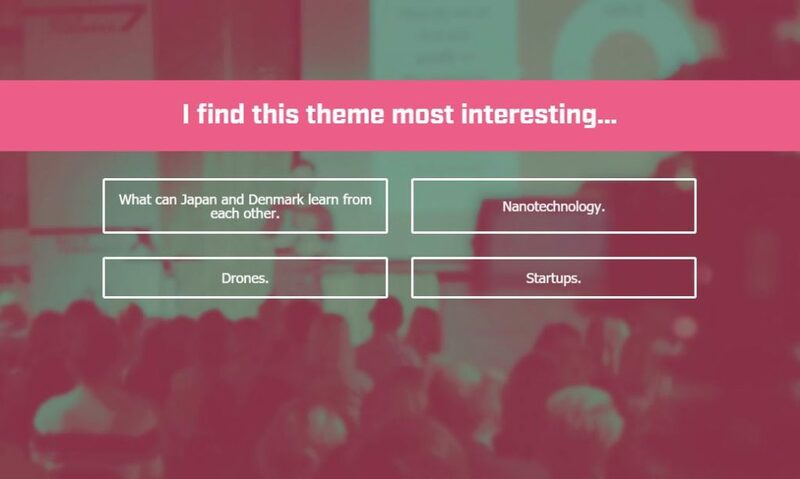 For a conference, you can apply the same mechanics; ask what topics interest people the most and what areas they want to improve, and in the end, you provide results with events tailored to their responses. 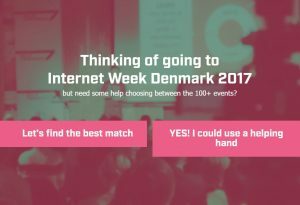 See below how Internet week 2017 did this nicely and assisted their guests to pick the right seminars and talks. This method is particularly useful for larger conferences or festivals with a wide selection of events or talks. 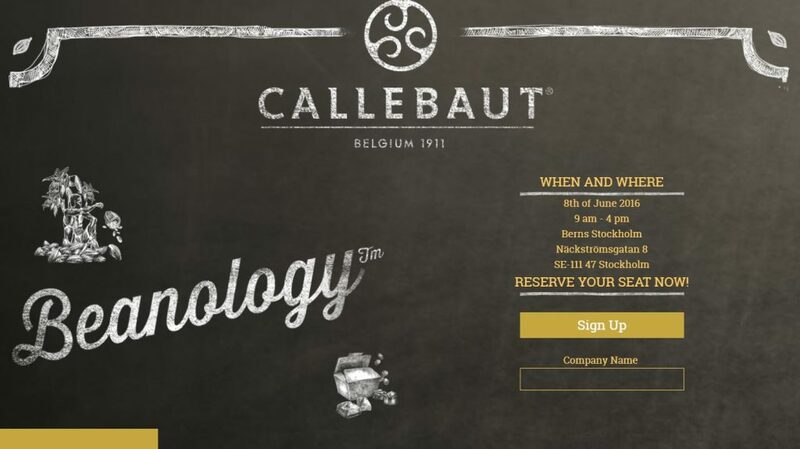 When promoting a private event, the interactive quiz can help you gain information about your guests, create exclusiveness and inform people about your company, all at the same time. You can offer people to participate in your quiz to get a ticket and in return, you grow your e-mail list and get sign ups for your event. Need to boost ticket sale? 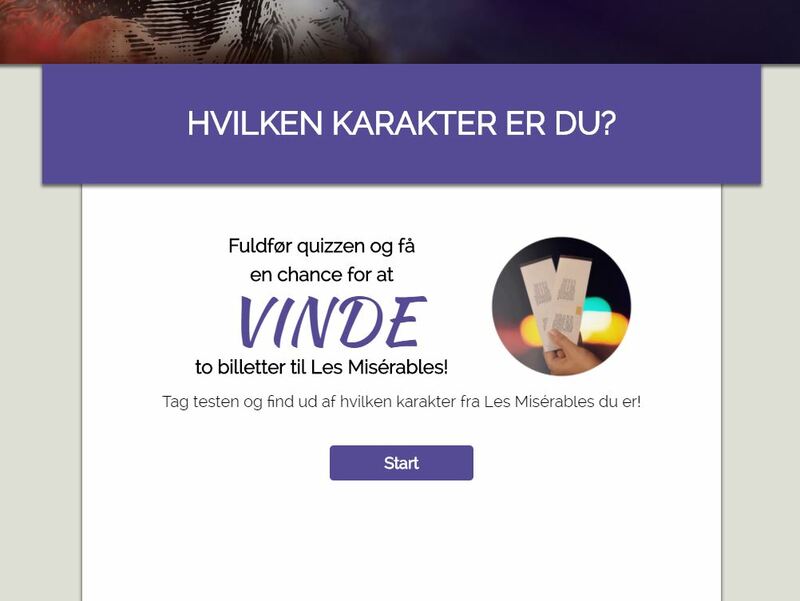 If you want to boost ticket sale, you can give tickets for free with an interactive quiz. Like mentioned above, when people sign up for the quiz, you get their email address and information about special interests and if you tailor the questions right, what they want to improve. This gives you a second chance to compose a personalised follow-up email promoting your ticket sale. Personalised marketing is increasingly becoming more important, especially when marketing for millennials and therefore this information is valuable. You promote your event, boost ticket sale and grow your email list all at once. Are you planning an event and want to give interactive content a try? 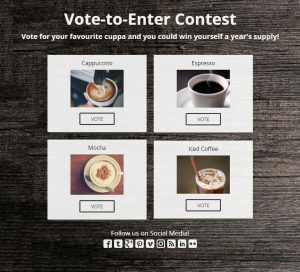 Boost sales and engagements? Try our 15- day trial at Dot.vu.